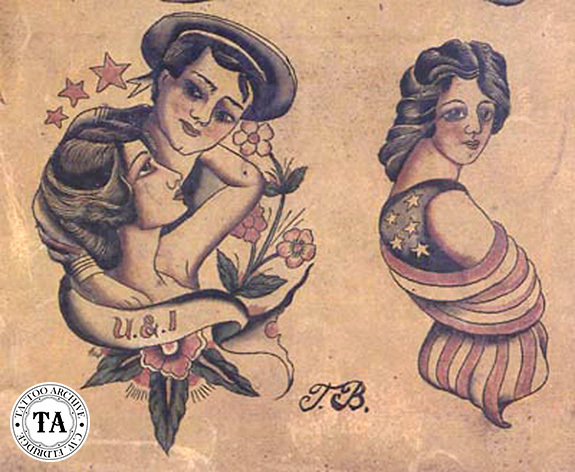 Tom Berg was said to be an English tattooist who came to the United States around the turn of the century. He is known to have tattooed in San Francisco, California at #537 Pacific Street in Room #5. There he worked with Adolph Hasberg doing hand and electric tattooing. 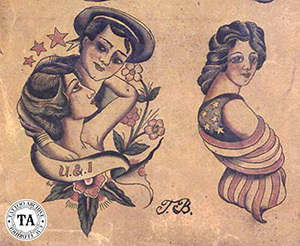 As with many tattooists of that era, Berg and Hasberg offered designs, stencils and pigment for sale. There was no mention of machines or needles for sale. The Pacific Street location that Berg and Hasberg worked was on the edge of what was known as "Devil's Acre", one of the roughest and toughest sections of old San Francisco. Also known as the "Barbary Coast" this area was lined with whorehouses, opium dens, shanghai bars, flop houses as well as the more up-scale "parlor houses". Tom Berg's address that included Room #5 probably meant that they operated out of a hotel or a house. Berg left us with several sheets of his flash. The designs were quite detailed for that era and from the look of it he must have worked with a single needle set-up, which was not unusual in England at the turn of the century.